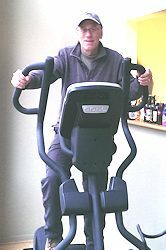 In this video, industry expert Fred Waters demonstrates the most important features to consider when buying an elliptical trainer. Learn what to look for as far as options, flywheel, stride length, rear or front design, resistance and programming. You want to find the right elliptical for both your budget and your fitness needs. Also check out our full Elliptical Buyer’s Guide section as well as reviews for all of our top recommended brands.